I recently had the opportunity to present to pre-service teachers about Comprehensive School Health and how they can embed wellness in the classroom. My strongest take home message was that healthy schools simply make sense because of the strong reciprocal relationship between health and education: Healthy students learn better and better-educated students are healthier. Providing a healthy environment for students will better prepare them to learn and reach their full academic potential. Evidence has shown that healthy children have higher attendance rates, are better able to concentrate in the classroom, are more engaged in the learning process, achieve higher grades on standardized tests, and are better prepared to continue learning long after graduating. Moving & Choosing has a variety of resources that provide simple, movement breaks within the classroom. Some of my favourites include Move & Play, Lucky Sevens and Yoga Techniques for the Classroom. Alberta Health Services created a Provincial Teacher Resource List which provides a list of resources for teachers about specific health topics. One of my favourite resources to support Mindfulness in the classroom is the Zen Me cards (available to borrow on Moving & Choosing) as well as the Moving & Choosing Mindfulness Kit. By practicing mindfulness techniques in the classroom you can help your students improve their abilities to pay attention, to calm down when they are upset, and to make better decisions. It also helps with emotional regulation and cognitive focus. 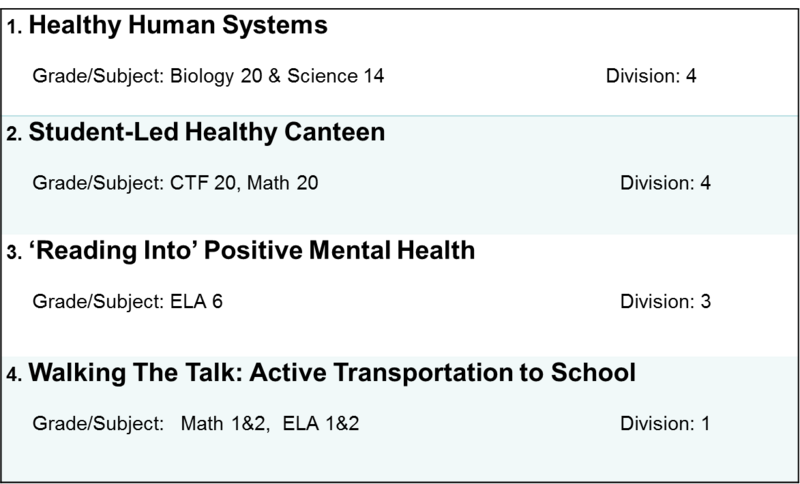 There are a variety of ways to incorporate specific concepts that are health related cross-curricular. Classroom centers can be for Division 1-4. Using AHS resources you can give students time to explore resources on their own time. We all play a role in creating a healthy school community. With support from Moving & Choosing and Alberta Health Services we can provide optimal “healthy” learning environments for our students. We do this because we know Healthy Students are Better Learners! Sonya Brown is a Health Promotion Coordinator for Alberta Health Services. March 2017.